I have long admired the patterns and books and fabric selections by Kim Diehl. I have yet to make one of her quilts though. 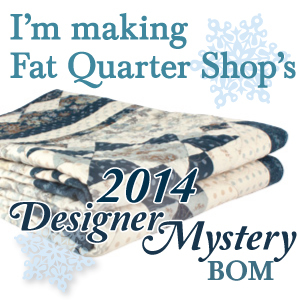 Through some easy persuasion (enabler is Nicole from Sister’s Choice Quilts blog), I decided to sign up for the 4th Annual Simple Whatnots Club with Fat Quarter Shop. I would provide a link to the club offering on the FQS website, but as of today – it is no longer there. Guess they are now sold out. Month 1 delivery of the club came to my mailbox on Friday. It is the one pictured in the middle of the top row. To use my daughter’s favorite word right now … Adorable! Now, I love my Fig Tree Quilts and I am still excited about getting my hands into the Strawberry Fields Revisited … but this bundle of fabric, delicious saturated colors, all neatly folded in the envelope above … I just couldn’t put it off. Plus, a 19 1/2″ square table topper should be quick and easy to knock out in a long holiday weekend. Because it is such a small scale block with small pieces, I made sure to check each unit as I made them and get them perfectly squared up before moving to the next steps. I kept working on it last night, adding the next round of inner borders and then starting on the final sets of flying geese units. This was the last updated picture I took (inside photo, at night – that design wall is an off-white color instead of pink). You would not believe how much fabric is left over in this kit. I sent an email to FQS just to make sure I wasn’t suppose to hold the extra fabric for future months. The kits are pricey, but you certainly get a good value for the amount of fabric that you get to add to your stash. Included in the price is the backing fabric as well. I hope to get the remaining borders done tonight or tomorrow. By Friday, I hope to share the final quilt top and I’ll post a picture of the remaining fabric, in case you were on the fence about signing up for one of these clubs in the future.